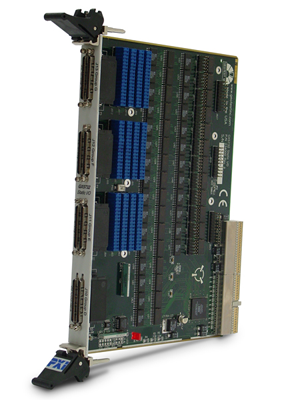 The GX5732 is a 6U PXI static digital I/O card with 224 TTL I/O channels. Designed for ATE, data acquisition, or process control systems where a large number of discrete I/O channels are required, the GX5732 offers the highest digital channel density in the industry for a single PXI plug-in board. The GX5732 provides 224 TTL channels that are programmable for either inputs or outputs in groups of eight. The GX5732 has no on-board memory and uses the computer’s memory and CPU power for data transfer. The GX5732 also has four 8-bit, bi-directional, 50 MHz counters. Eight I/O pins on the counter port can be used as inputs or outputs to any of the counters. An additional 4 outputs can be used as counter outputs or as a Terminal Counts (TC) for all counters. Six programmable inputs are provided for counter control: clock, gate, or load. The counters may be daisy chained to create two 16-bit counters, or one 32-bit counter. The clock source can be the PCI clock, PXI clock, an external clock, or another counter.